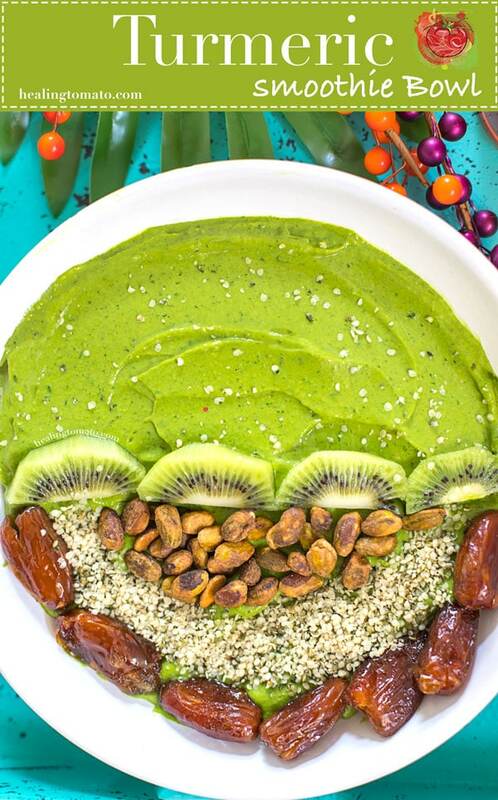 This vegan turmeric smoothie bowl is the perfect healthy breakfast recipe. Made with Kale, vegan yogurt and a good load of turmeric powder in it. Turmeric has amazing healing properties and very little taste. Yet, it packs quite an Ayurvedic punch in any recipe. If you are like me, you love breakfast in bed! Most of the time, I get pancakes or waffles which is delicious. 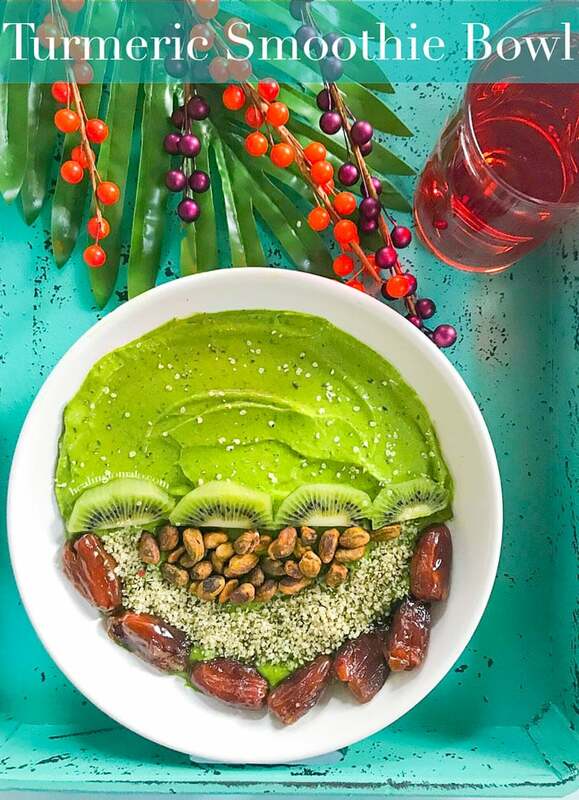 This time, I went with this Turmeric Smoothie bowl for breakfast in bed. Its so easy to make because all it needs is to blend the ingredients and transfer to a bowl. Turmeric is nothing new in Indian cuisine. We use it in appetizers like my tofu skewers or main dishes like my Bombay potatoes. Its in our drinks, breakfast recipes and even desserts! 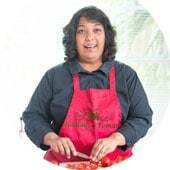 I think the only meal that its not seen is when we cook pure Basmati rice. Growing up, we were always told about turmeric and how its the super spice! Its good for the body on the inside as well as the outside. So many facial creams, masks and soaps contain this spice. It helps clear the skin blemishes and also helps fight the aging process. If you are not comfortable with the taste of turmeric, then this recipe is perfect for you. Its in the recipe but you won’t taste it at all. Its one of those spices that does its magic in the background without wanting any attention. I put 1 Tbsp of turmeric in this recipe, but, if you are comfortable, you can even go for 1.5 Tbsp. The best way to get turmeric is by (affiliate link) grinding turmeric root. However, if you don’t have time, you can always get (affiliate link) turmeric powder and use it in all kinds of recipes. For the dates, I decided to heat them up a little and add maple syrup. This way, they are sweet and juicy when you pop them in your mouth. 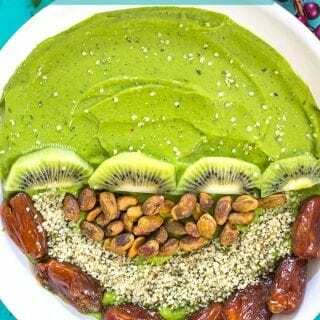 I have a chocolate banana smoothie bowl with avocado that you will love just as much as this recipe. 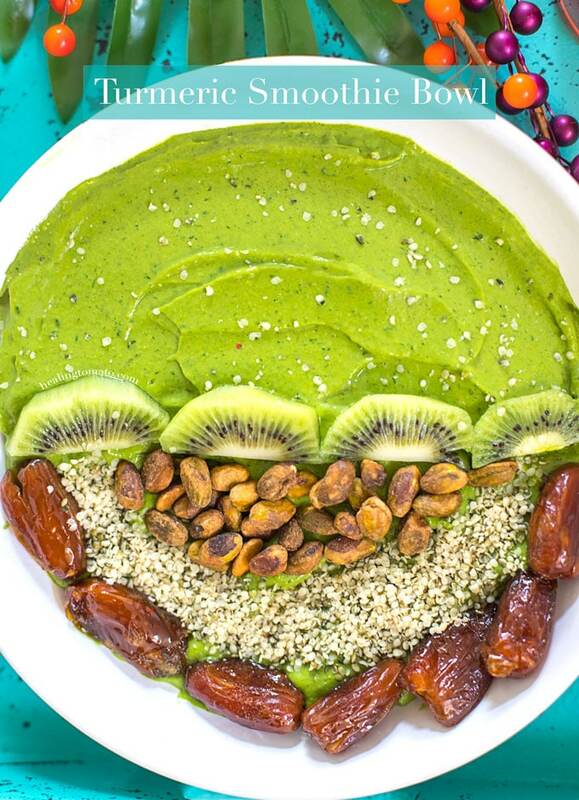 The dates really steal the show, even though the green smoothie color grabs your attention. I loved how delicious the dates tasted with all the other ingredients. What’s your favorite turmeric recipe? 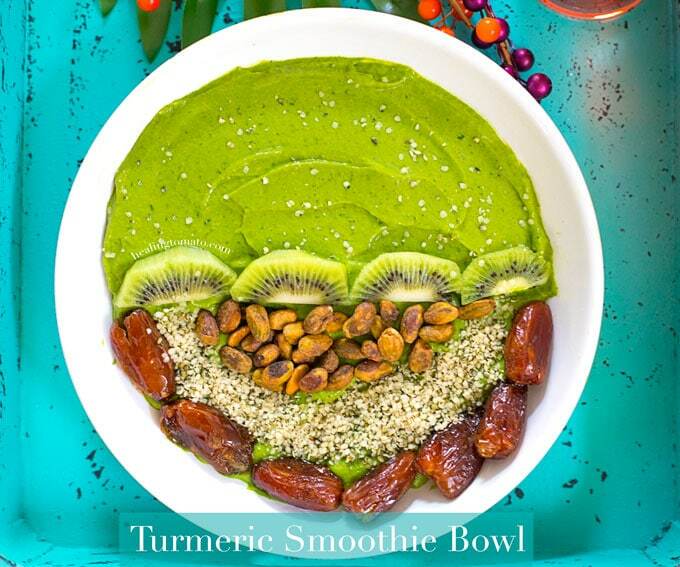 Vegan Turmeric Smoothie Bowl made with healthy ingredients. - I don't like eating raw Medjool dates, so, I heat them up with agave before adding to any recipe. If you don't have a problem with raw dates, you can skip the process of heating them with agave.